Behind the demands of a baker for good bread and the brewer for good beer there are genetic variants that human beings have observed, preserved and developed. Our Daily Bread tells this diverse history. 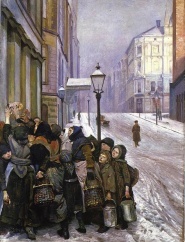 The book «Our Daily Bread - The history of cereals» is a revised version of a book published in Norwegian in 2010. The world has three great grain cultures: the Asian based on rice, the American based on maize and the Eurasian based on wheat, rye, barley and oats. In Europe these have divided the continent into three bread zones: wheat in the West, rye in the East and barley or oats in the North. All originated in the Middle East. A few thousand years later they were grown to 70 degrees N in Norway and to 4000 meters in Ethiopia. Which mutations made this possible? What mutations enabled the phenomenal increases in grain production in the 20th century? In spring 2008, a surprised Western media started to report about food and grain supply as news material. Financial newspapers printed report after report about rice farmer welfare in Thailand. Writing about food was no longer tantamount with restaurant menus or new gourmet products. Sighted investors had noticed that the prices of grain had fallen over many decades, a trend they hoped would turn back. And so, from 2005 to 2008, the world market prices for wheat and corn became tripled, rice quintupled. How can the world feed itself in 2050 when the worlds population rises to 9 billion, and grains not only must feed us, but also supply raw materials and fuel to a bioeconomy? Åsmund Bjørnstad (f. 1951) is a Professor of Plant Breeding in the Norwegian University of Life Sciences in Ås, Norway.